Extend cooking oil life - with one of Dean's heavy-duty portable oil filters. Periodic use reduces oil costs and dramatically improves food flavor and consistency. Clean and polish your cooking oil with Dean's special recycling process. By using filter paper and special acid absorbing powder, the Dean portable filter removes all foreign particles from micron-sized carbon deposits to solid food particles and fatty acids. Dean's unique process allows filtering as often as necessary. The result is contaminant-free oil, which means a greater yield of more delectable golden fried foods. The powerful 5 GPM pump automatically recycles the oil and returns it to your fryer. Risk of splashing hot oil is reduced by a return hose that reaches to the bottom of the fryer. Debris is trapped in the easy-to-clean paper filter within the filter pan. Select the filter size you need - Dean portable oil filters are available in capacities from 80-110 lbs. (45-62 L). For ease in filtering, all Dean filters will fit under the drain of all Dean fryers. 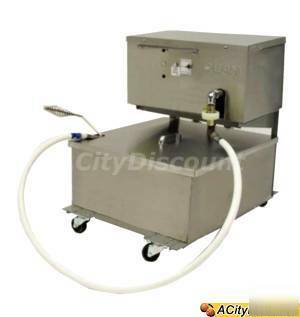 Flexibility - Available in gravity drain (U) or suction type/reversible pump (AU) for filtering of countertop fryers.